This 50th anniversary re-issue of the original 1964 recording is enhanced with 24-bit remastering and new liner notes by Peanuts historian Derrick Bang. Among the nine tracks from the original Fantasy recording is the now-iconic Linus and Lucy which eventually made its way to prime-time television a year later in the soundtrack to A Charlie Brown Christmas. Also includes two bonus tracks! 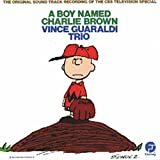 This is a 'MUST HAVE' for all Peanuts fans, and fans of the classic sounds of the beloved Peanuts music by Vince Guaraldi.